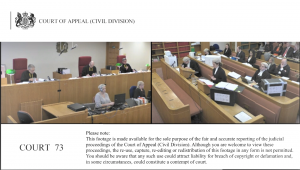 The first Court of Appeal (Civil Division) hearing to be live-streamed in full will start on Thursday 15 November as a public pilot for a new service designed to increase public access to the work of the court. In the case selected for the public pilot, West Ham United and E20 which manages the former Olympic stadium are in dispute as to the seating capacity that should be made available to the football club for its home fixtures at what is now known as the London stadium in Stratford, East London. The live streaming will be available through the judiciary website. Sir Terence Etherton, the Master of the Rolls, said: “This is an exciting way of opening up our courts to help the public understand and see for themselves the way that courts work, and how appeals are heard. The first case is a high profile one with a great deal of public interest, which is why it has been selected for the public pilot. Live-streaming of court proceedings has taken place for some time in the UK Supreme Court, but only since 2013 have certain proceedings in the Court of Appeal been selected by the media for filming and broadcast. Live-streaming of full hearings in the court in this manner has not happened before. Under this system, cases are selected for live-stream by the court itself. The image broadcast will be of a split screen, with simultaneous broadcast of the judicial bench and the front rows of counsel in the case. Following a period of test filming, this will be the first ‘live’ broadcast for an external audience. The proceedings are subject to a short delay, as per the Supreme Court’s system, which allows for a case to be halted to ensure that (for example) an inadvertent breach of a reporting restriction would not be broadcast. The public pilot will be subject to an evaluation before live-streaming is extended. If the pilot is successful, the Master of the Rolls will seek an amendment of the existing Statutory Instrument to enable family appeals to be live-streamed, a move supported by senior family judges. Virtually all courts and tribunals in England and Wales are open to the public and Press.